Recent and upcoming product launches from Intel and Nvidia spell stiff competition for AMD. But there could be some light at the end of the tunnel. AMD (AMD - Get Report) surged in late 2016 and early 2017 amid a wave of excitement about pending chip launches, only to see its shares then slump amid a giant tech rally as rivals launched counterattacks and some of its launches failed to live up to the hype. 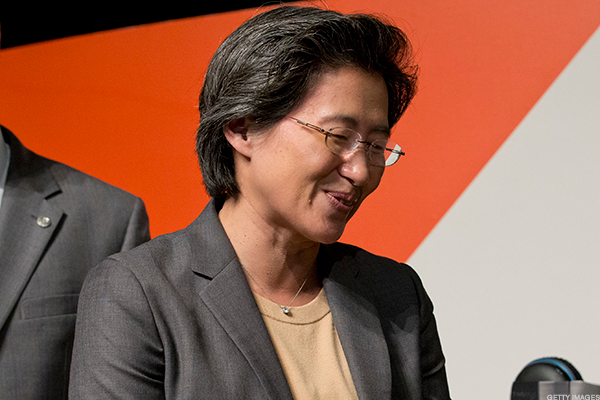 Something resembling the opposite storyline could play out in 2018, at least as far as AMD's performance goes. However, much depends on the company's execution. (On Wednesday morning, shares were spiking more than 5% on a report that some of Intel's PC chips possess a design flaw that could potentially expose sensitive information such as passwords and log-ins to hackers). After rising over 400% in 2016 -- putting an end to bankruptcy fears and halting major revenue declines can do that for you -- AMD's shares continued rallying in early 2017 on enthusiasm about the pending launch of its Ryzen desktop CPU line, the first products based on AMD's next-gen Zen CPU core architecture. There was also some enthusiasm for the expected summer launches of AMD's Vega desktop GPU line and Epyc server CPU line. Ryzen was hardly a dud: It left AMD on much better mid-range and high-end desktop footing than it has been in years, and the follow-up launch of the company's Ryzen Threadripper CPUs for enthusiast and workstation users also went well. However, there was a measure of disappointment over Ryzen's performance in gaming benchmarks. And on the notebook side, the respectable CPU performance and strong GPU performance of AMD's Ryzen Mobile processors (they launched this fall) was partly offset by mediocre battery life. Perhaps more importantly, Intel (INTC - Get Report) countered AMD's launches by starting the rollout of 8th-gen desktop and notebook processors -- some are based on the Kaby Lake architecture launched in 2017, and others on the newer Coffee Lake architecture -- that often deliver 30%-plus performance gains in benchmarks relative to comparable 7th-gen chips. Reports and leaked roadmaps indicate quite a few additional Coffee Lake parts are on the way, with the breadth of Intel's Coffee Lake desktop lineup exceeding that of either its 6th or 7th-gen lineups. On the GPU side of things, AMD's Vega 64 and 56 desktop chips did make its lineup more competitive with Nvidia's (NVDA - Get Report) high-end Pascal-architecture GPUs But their performance didn't match that of Nvidia's two most powerful gaming GPUs, the GeForce GTX 1080 Ti and Titan Xp, and they were considerably more power-hungry than rival Nvidia parts. And we'll soon see the launch of the first gaming GPUs based on Nvidia's next-gen Volta architecture. As for Epyc, it managed to impress: The server CPUs (also relying on Zen cores) deliver solid performance, support a lot of memory bandwidth and I/O connectivity, and come with several novel features, including support for features on single-CPU servers that Intel has traditionally reserved for dual-CPU servers. But competitively, this was always the AMD product line facing the toughest fight, given the big advantages Intel wields in areas such as enterprise/cloud mindshare, product line breadth, complementary solutions and developer support. In addition, it wasn't long after Epyc launched that Intel rolled out a major refresh to its Xeon server CPU line (the Xeon Scalable family, based on the company's Skylake architecture) that was well-received and promptly sparked a fresh server upgrade cycle. Epyc can still succeed, given its price/performance and feature set, but winning over big enterprises and cloud giants is far from an overnight process. Thanks to Intel and Nvidia's competitive positioning, the first few months of 2018 could be rocky for AMD. Upcoming Coffee Lake launches will add to the competitive pressure placed on Ryzen by Intel's 8th-gen lineup, and Volta will increase Nvidia's high-end gaming GPU lead while giving it more leeway to undercut AMD by slashing Pascal prices. AMD is expected to counter Intel's 8th-gen launches in a couple of months by launching Ryzen CPUs based on a 12-nanometer process (more advanced than the 14-nanometer process it currently uses). But this is expected to be an incremental upgrade, and it might not be long after it arrives that Intel finally launches CPUs based on its much-delayed Cannonlake architecture, its first to be based on a 10-nanometer process (arguably competitive with 7-nanometer processes from rivals). On the other hand, the expected early-2019 launch of the first AMD PC CPUs based on a 7-nanometer process from partner Globalfoundries could very well be a game-changer. Both due to the manufacturing process used, as well as the reliance of the chips, codenamed Matisse, on second-gen Zen CPU cores. Though plenty of what-ifs still exist, Intel's 10-nanometer delays do appear to provide AMD with an opening. And ahead of Matisse's launch, AMD is expected to launch GPUs based on its next-gen Navi architecture, which also relies on a 7-nanometer process. It's probably best not to expect miracles from Navi for now, given the size of Nvidia's current performance lead and GPU R&D budget edge, but it should certainly boost AMD's competitive standing. Meanwhile, though it won't eat Intel's lunch, Epyc should gradually make some headway with major enterprise and cloud server buyers, given its selling points. And it, too, is due to see a 7-nanometer refresh in 2019. Markets are forward-looking. Should it become clear by late 2018 that AMD's 7-nanometer CPUs are likely to provide major sales and market share lifts, the news will begin to be priced into shares long before shipments ramp. And any success for Navi could be priced in sooner. Just be aware that AMD still has to make good on its 7-nanometer promises. And that even if it does, the ride could be bumpy until then.